How many time zones are there in Europe? Is there any Active Volcano in Europe? What Are Europe's Continental Boundaries? What European Countries are not members of EU? There has been much confusion whether it will be 'Leave' or 'Remain.'. However, after four long months of campaigning from both the sides, the referendum took lace on June 23, 2016. The result came out on June 24, 2016 which said that 'Leave' made it. 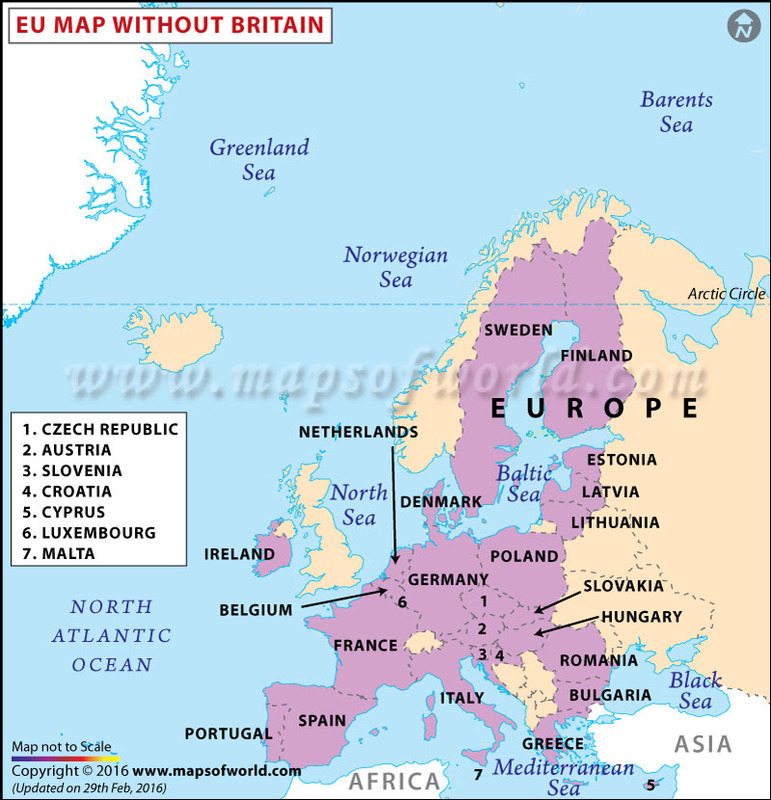 Britain is the first country to separate itself from the Union European. It is assumed that two more years will be required to sort out everything for the final exit. Should the UK remain a member of the European Union or leave the bloc? That's the question the people of the UK have to answer on June 23. As the world watches the developments taking place ahead of the crucial Brexit Referendum, let's have a better understanding about referendum and what is the concern all about. UK Prime Minister David Cameron has announced that a referendum on whether Britain should remain in the European Union will be held on Thursday, June 23, 2016. If you know what Brexit means, you would be able to understand what the referendum is all about. Brexit has been formed merging the words 'Britain' and 'exit'. You might be reminded of the Grexit, a Greek exit from the EU. It is a shorter way of saying that the UK is leaving the EU. There has been a growing feeling among the common people and politicians of the UK that EU has changed in the last 40 years since the UK voted to stay within the block. They ague that this bloc has started to extend its control over many more aspects of daily lives. The politicians say that Britain's progress is being held back by the EU by imposing too many rules on business. Despite the bleak picture that the politicians are portraying, about one-third of Britain's biggest companies, including BP, Shell, Marks & Spencer, and British Telecom, have opined that leaving the EU would be a misguided step and it would put UK's economy at risk. What gave a significant push to PM David Cameron's call to stay in the bloc was the letter signed by nearly 200 companies putting forward the advantages of retaining EU membership. Who Supports UK's Stay in the EU? David Cameron and 16 members of his cabinet support the idea of staying in the EU. According to them, the EU membership gives Britain a major boost in terms of selling things to other EU countries. They also argue that the the flow of young immigrants triggers economic growth. The ones opposing Brexit fear that Britain's status in the world would be damaged by leaving the Bloc. While Prime Minister David Cameron is in support of staying in the European Union, the Conservative mayor of London, Boris Johnson, favors the idea of the UK leaving the EU. Along with him, six members of Cameron’s cabinet have now come out heavily in support of quitting Europe. According to them, staying in the EU is like anticipating doomsday for British sovereignty. If media reports are to be believed, almost half of Conservative MPs and several Labour MPs are also in favor of leaving the EU. What Does the US Have to say? Whether the UK is better within the EU or out of it is not an easy question to answer. It depends on what the people believe is more important. However, leaving the EU will surely be a big step.